What direction will your life take in service to the kingdom of God? Thousands of men and women serving Christ as missionaries, pastors and teachers all over the globe have found that a Southeastern education was exactly what God had in store to equip and train them for service. We’re producing Great Commission-minded students who desire all people, everywhere, to glorify Christ. Preview Days at Southeastern are unique opportunities to see firsthand what God is doing at Southeastern, to hear from our faculty and students and to fellowship with others, just like you, who are discerning a call to ministry. Sit in on classes, tour the campus and have all your questions about life and learning at the College at Southeastern answered. Our Preview Days will allow you to seek God’s calling in your life, whether He leads you to Southeastern or elsewhere. While on the campus, you will not only meet the faculty, you will get to know them at a dinner. An informal information panel led by a handful of professors will revolve around questions from you and other prospective students. Please enjoy an online walkthrough of the College at Southeastern and Southeastern Baptist Theological Seminary. 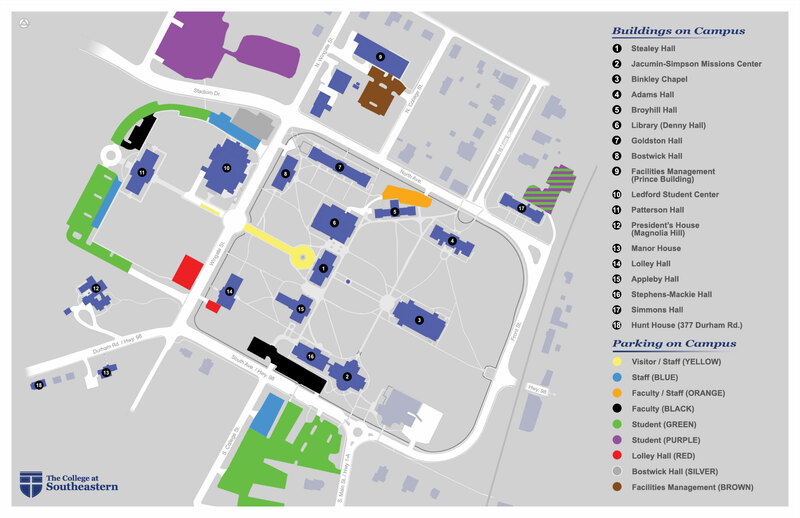 This walkthrough features many areas of our beautiful Wake Forest, NC campus. For more information call 1(800) 284-6317 or (919) 761-2283. During the spring or fall semesters, campus tours are given Tuesday-Friday by appointment. Tours begin at 10:00am on Tuesdays and Thursdays and 11:00am on Wednesdays and Fridays. During tours you have the opportunity to worship with us in chapel (Tuesdays and Thursdays), meet professors and students, visit classes, get information from various campus offices and experience the life and vibrancy of a Great Commission school. We offer two nights of complimentary housing during your visit. Although course schedules and professors’ office hours follow a different pattern during the summer, the summer months still provide a great opportunity for you to visit campus! Summer visits are given Tuesday-Friday by appointment, with tours beginning at 11:00am daily. These visits include the opportunity to meet with a Southeastern representative, take a tour of the campus and get information from various campus offices. We offer two nights of complimentary housing during your visit. Up to two nights of free housing accommodations are available at our Manor House upon 48 hours notice. If you are staying overnight at our Manor House, check-in time is after 3pm, and check out is 10am.